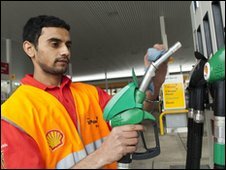 Anglo-Dutch oil giant Royal Dutch Shell has frozen pay for its top management following a shareholder revolt last year. In May, 60% of Shell's shareholders voted against its remuneration report at its annual meeting. Shell said the salaries for its chief executive and chief financial officer were being frozen until 2011. The company said it wanted to "demonstrate appropriate restraint in the current economic environment". Hans Wijers, chairman of Shell's Remuneration Committee, told its investors of its new measures in a letter that has been published on its website. The company said its chief executive, Peter Voser, and chief financial officer, Simon Henry, had salaries that were 20% lower than their predecessors. "We will require a mandatory deferral of 25% of any annual bonus" into the firm's deferred bonus plan, Mr Wijers said, in addition to a voluntary deferral of up to a further 25% it had previously outlined. Shell will also award bonuses based on how well projects are delivered, rather than its previous measure of total shareholder return. Last week, the company reported a sharp fall in profits between October and December last year due to falling demand for oil from a weak global economy.